Ilya Ivanovich Ivanov was a trusted and well known Russian and Soviet biologist who first garnered recognition when he successfully used one stallion to fertilize 500 mares via artificial insemination. 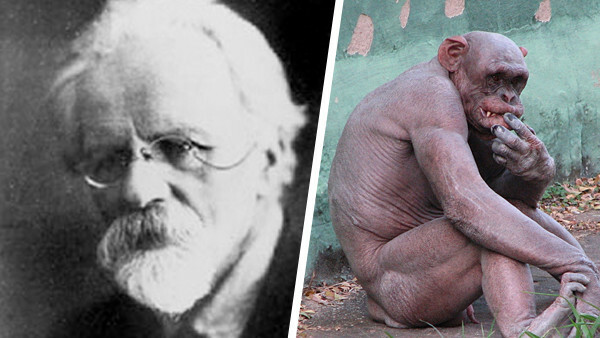 In 1910, he gave a presentation at the World Congress of Zoologists in which he described the possibility of creating a human/chimpanzee hybrid using his new technology. News of this found its way to Joseph Stalin. There is a misconception that Stalin ordered Ivanov to create a human/ape hybrid soldier that would be supernaturally strong, feel no pain, and eat anything to keep nourished. The truth is, Stalin wanted to use the experiment to disprove the creation myth and show evolution at work by creating a new species. At first, Ivanov tried impregnating female chimpanzees using the sperm of human males. The experiment was a failure. After that he switched roles and tried to impregnate a human woman with the sperm of an orangutan. He managed to find a woman who was willing to carry the hybrid baby but the orangutan died before the experiment could take place. Due to political changes the experiment came under much criticism and Ivanov was eventually arrested and exiled before he could finish his experiment.